Product consists of three 8.5 x 11" prints - full saturation of semigloss ink on a premium matte cardstock. Hanger and backdrop NOT included. 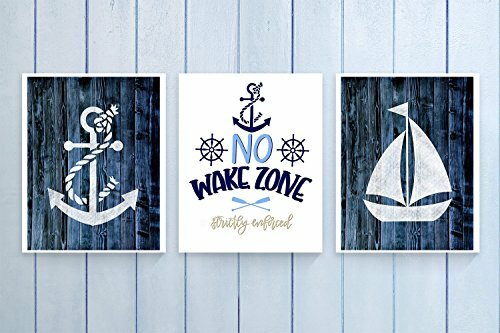 Add a little whimsy and a little decor to any nursery with our navy blue nautical three piece graphic handlettered "No Wake Zone" "Anchor" and "Sailboat" prints. Standard print is a 8.5 x11 cardstock print. Prints are unmatted and unframed, ready to be placed in your favorite frame. Original artwork: all June & Lucy paper goods are exclusively created and designed by me personally. Please don't steal them. Three Piece Cardstock Nursery Prints 8.5 x11 "Explore"